Taking the road less traveled has made all the difference. By the looks of it, I’m not sure if either one of our OTPs or even 2D1N will make it by the end of The Producers. But of course this is a fictional drama, sooo everything will probably turn out just fine. That was also how I felt by the end of this episode because it seemed like no matter how big the problem seems right now for our beloved characters, everything will be okay. If the drama gods decide to be extremely cruel to us and Chandy/JooJin don’t happen, rest assured that the four of them are loyal friends who will be there for one another when the going gets tough. That’s what true friendship looks like, y’all! But seriously though, Team Chandy. UNDER CONSIDERATION | Seung Chan’s ballsy move of kissing Ye Jin didn’t exactly result in her falling in love with him. Instead, he’s the one who’s feeling shy and embarrassed while she’s just confused. He tells her that the purpose of him kissing her all of sudden like that is to let her know that he’s a man too, and not just the obedient and cute junior that she knows him as. Ye jin doesn’t seem to be buying this new manly version of him, and is more amused than anything else. She advises him to protect the relationship they already have instead of changing it. Our suddenly very courageous Seung Chan argues that he did that once before, but he doesn’t wanna lose out on a possible opportunity with her now. He can try, but I’m still got my allegiance to Team Chandy. THE ROAD NOT TAKEN | Even Joon Mo had to give the rookie props when Ye Jin tells him how Seung Chan explained that she only puts up a tough image because she’s afraid of getting hurt. 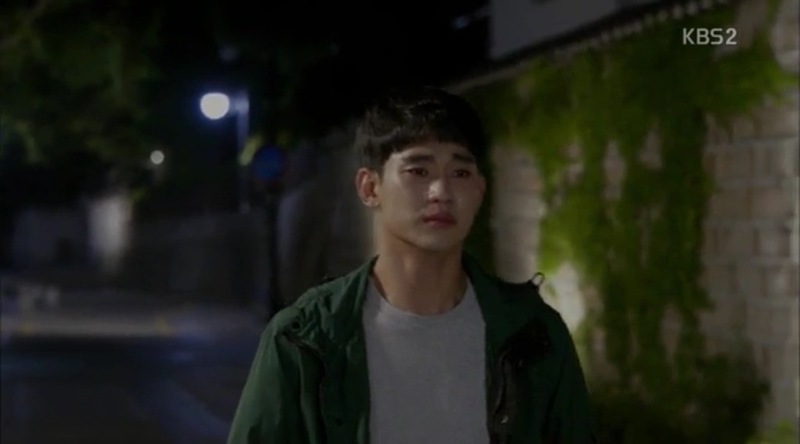 Joon Mo agrees and reassures her that she’s more deserving of love than she gives herself credit for. 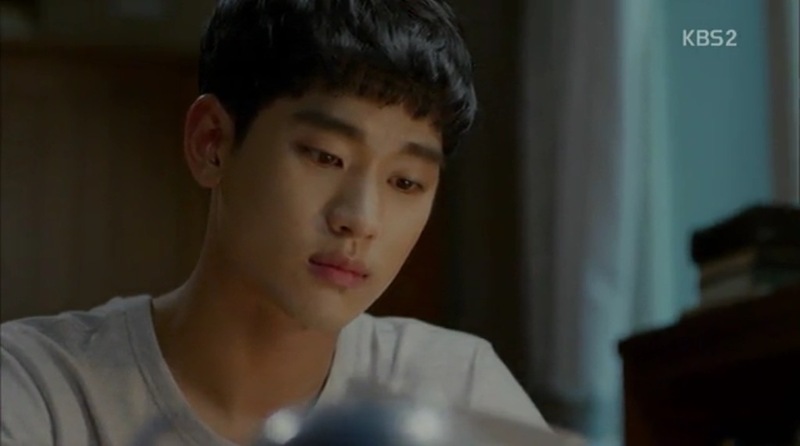 On the other side, Seung Chan is unsure of what to do, so he seeks some advice from his mom. She tells him that there was another man before his dad, and she sometimes wonder if she would have been happier if she had married him instead. Hearing this, Seung Chan’s reminded of Robert Frost’s poem, “The Road Not Taken,” about having to choose between two diverging paths. Yo, got a little teary-eyed listening to him recite the poem, despite not understanding Korean. 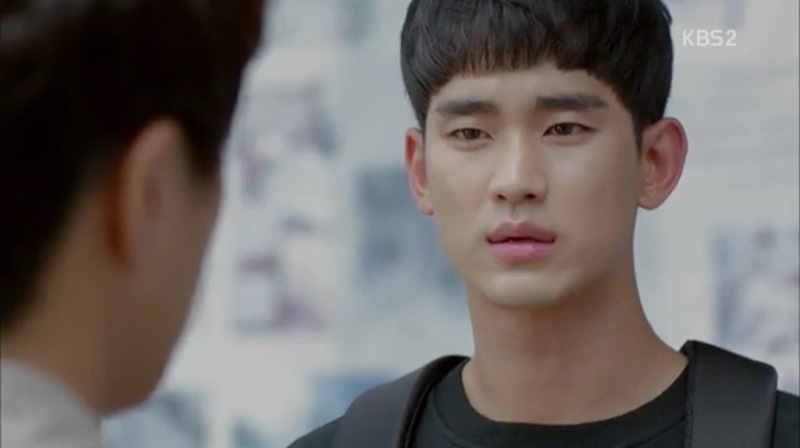 The charisma of Kim Soo Hyun, ladies and gentlemen! A CHAPTER ENDS, A NEW ONE BEGINS | On Ye Jin’s move out day, she gets really sentimental because she feels like she’s closing a chapter in her life. She tells Joon Mo that she’s really happy that she has him in her life. He tries to act cool about it, but he’s definitely holding in those unspoken feelings. 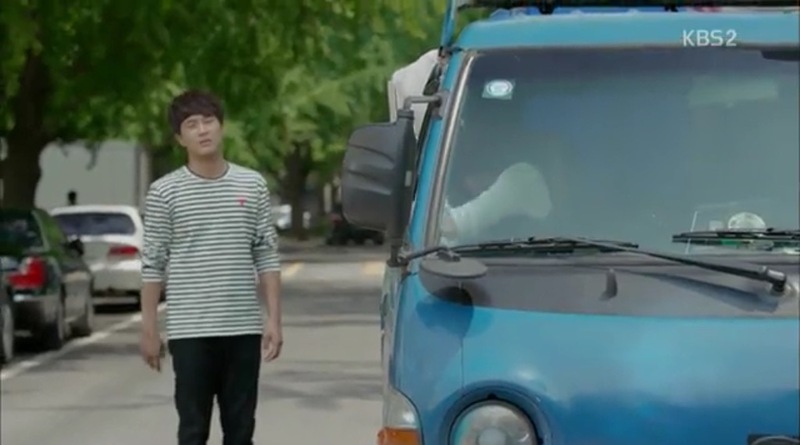 As Ye Jin and her moving van are pulling away, Seung Chan sprints to say goodbye…but he’s too late. Watery eyes all around. The guys continue to have a crappy day at work too when they find out the pilot program got high ratings. Basically, it’s only a matter of time before 2D1N gets the axe. Not ready to say goodbye. COULD YOU SPARE A VIEWER? | CEO Byun continues her attempts to derail Cindy’s career by refusing to book her any clothing sponsors, but who gives a crap about that. The latest Cindy gossip on the Interwebz has her labeled as a “beggar” after she did the voiceover for Seung Chan’s 2D1N preview. She claims that she’s upset with him and needs to yell at him in person, but we all know she just wants to see his beautiful face. Seung Chan tries to convince her that this image makes her look cute and lovable, but Cindy insists that this is his all fault, so he has to make it up to her. She’ll let him know when she figures out how he can do just that. Hehe, Chandy! EXTREME MAKEOVER: HOME EDITION | Ye Jin’s mover refused to help her move the furniture inside, but no worries because Seung Chan and Joon Mo are both here. Our caring Seung Chan noticed that the street lamps near the apartment are broken, so he advises Ye Jin to file a complaint about fixing them. Joon Mo, per usual, acts all nonchalant and tells them to just chillax. Afterwards, Joon Mo reluctantly gives Seung Chan a ride home and it’s…awkward. Seung Chan breaks the silence by telling Joon Mo that Ye Jin is akin to an epic program with amazing ratings. No matter how hard he tries to improve his sho, he will never be able to reach those ratings. And that’s why he sincerely envies Joon Mo. They do, however, get a bonding moment the next day when Seung Chan willingly ditches having lunch with the higher-ups to stand by Joon Mo and their failing program. One man’s “friend” is another man’s love. DEBT REPAID | The reason Seung Chan’s phone is off is because he’s out on his last “date” with Ye Jin in exchange for the remainder of her debt to him. On the walk home, he admits that he’s sad because this will be the last time they can spend time together like this. Ye Jin tells him that she feels sorry because he’s really a great guy, and thanks him for being so kind and wonderful to her. She feels lucky to have him like her because it made her feel her own self worth. As she starts to leave, Seung Chan stops her and says that her thankful feelings towards him can eventually become love. He asks her to give him some time too. 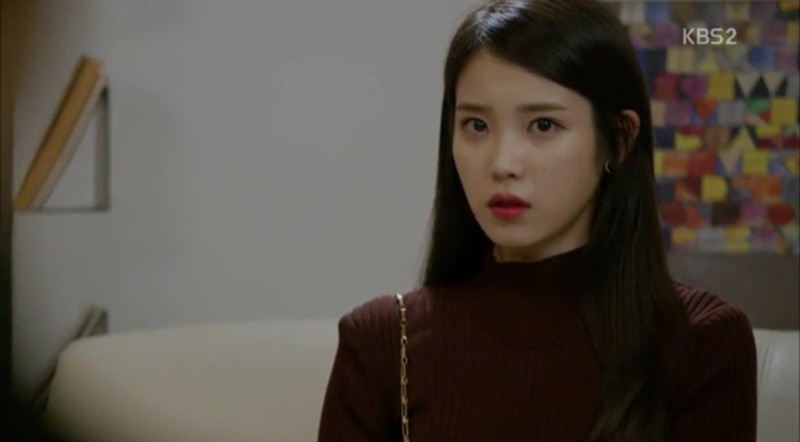 Although we don’t know what Ye Jin’s exact response was, Seung Chan’s tearful walk home alone is telling enough. My poor baby. GOING ON HIATUS | Seung Chan sees the text messages that Cindy left him, where she says that she will be living a very different life soon and that she’s sorry she can’t see him for awhile. It’s only then that he finds the news articles about the drama surrounding Cindy’s background, but it’s already all over Korea. 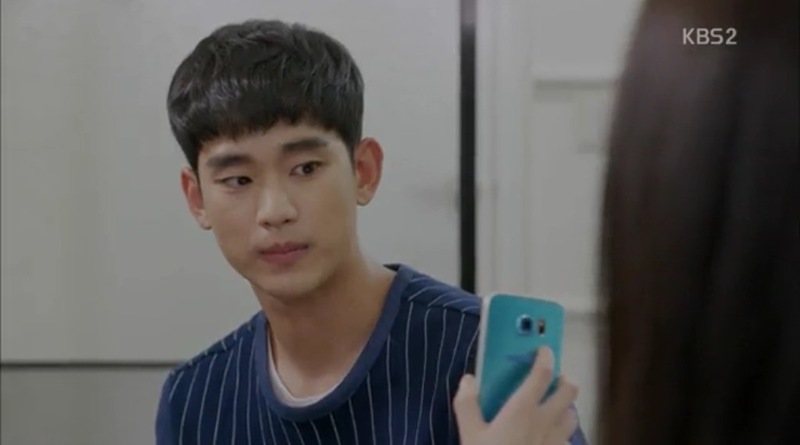 He tells Joon Mo that there’s no way Cindy purposely lied especially because she told him before about having insomnia over her parents’ passing. Joon Mo agrees but still tells him to prepare a substitute for Cindy on 2D1N. Seung Chan argues that as PDs, they should show her that they tried their hardest to help her. Joon Mo just shakes his head at his misplaced idealism and walks away. ILLUMINATION | Ye Jin uses the flashlight pen that Seung Chan gifted her when she’s walking home at night. But to her surprise, the street lamps near her house are fixed and lit. Her first assumption is that Seung Chan really did file the complaint for her, which brings a smile to her face. But surprise! It was actually Joon Mo who made sure that people went to fix the lights. WE GOT YOU | Whether it was Seung Chan’s words or finding out that Yuna (Cindy’s predecessor) is happy and doing really well away from the spotlight, Joon Mo decides that there’s no way he will abandon Cindy. You go, Joon Mo! Meanwhile, Cindy is having trouble sleeping again. When she does finally fall asleep, she’s woken up by a mist of water. In a daze, she opens her eyes to one of the most beautiful sights ever: Seung Chan’s smiling face. She sits up and sees the entire 2D1N team and her loyal manager standing around her bedroom, with Joon Mo telling her to get ready for the filming. Cindy breaks down in tears seeing everyone’s friendly smiles, and I’m sobbing right alongside her. 2D1N & Chandy for life!